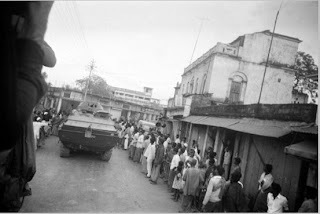 Bengali people welcomes Indian army tanks in the streets of Jessore on December 12, 1971 during the Indo-Pakistani War of 1971. I recall how I took two bus loads of Indian and foreign correspondents at the start of the war to airfields in Jullundar to show how Pakistan started the war, continued the dissemination of information of the operations during the crucial two weeks, and coordinated the coverage of the surrender ceremony. It would also be fitting if the nation recognizes the occasion as a unique achievement of the Armed Forces of the country, which helped to end the war with reduced violence and the safe return to Pakistan of over 90,000 Pakistani prisoners-of-war. The 1971 India-Pakistan war was a joint effort of the Indian Armed Forces and the Mukti Bahini, ably supported by all arms of the government, including the Ministry of External Affairs, the Ministry of Information and Broadcasting and the intelligence agencies. The war, which could have lingered on for months, was brought to an end in twelve days, thanks to the ability and sagacity of those who were involved in the effort.